Having modern cabinetry installed in your home is one of the quickest ways to update the overall look of your house. Old cabinets in your home may be worn down and in need of a facelift, not to mention that they can leave your house looking as if it were stuck in time 30 years ago. At Reborn Remodeling Solutions, we manufacture and install truly custom cabinets, and we can have your kitchen, bathroom, and other rooms throughout your home looking up-to-date once again with the latest in modern cabinetry styles, materials, and colors. Allow you to choose from a multitude of options of wood species, door and drawer front styles, stains, glazes, and hardware options. Take exact measurements of where your new cabinets will be to provide precise installation and a flawless, seamless look. Manufacture the cabinetry in our state-of-the-art 40,000-square-foot manufacturing facility, right here in Anaheim, then finish each individual piece by hand. Professionally install your all-new floor and wall cabinets in your home, and outfit the area above the cabinets with crown molding if desired for an elegant appearance. 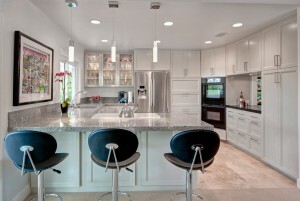 The professionals from Reborn Remodeling Solutions are the modern cabinetry contractors you can rely on. Of course, it’s easy to say that you can trust us, but the facts about our company will back it up. Since 1983, we have served thousands upon thousands of homeowners in Southern California who are now very satisfied customers. We are a proud member of the National Kitchen and Bath Association and are frequently mentioned as one of Remodeling Magazine’s Big 50 home remodelers. Best of all, though, we are famous for our friendly service and back our modern cabinetry with a 25-year warranty. If you would like to find out more information about how Reborn Remodeling Solutions can outfit your kitchen, bathroom, or anywhere else in your home with modern cabinetry, please give us a call at 1-877-371-4943 or stop by our showroom and manufacturing facility on 2981 E. La Palma Ave. in Anaheim today. We are proud to manufacture and install custom cabinets for residents of Los Angeles, Laguna Niguel, Placentia, Yorba Linda, Santa Ana, Brea, Fountain Valley, Huntington Beach, Mission Viejo, all other Orange County communities, and throughout Southern California. "Very happy with our new shower. Glad we used Reborn."